Please Contact owner Dave after 1 PM at 301-371-7153 or 240-285-7805. 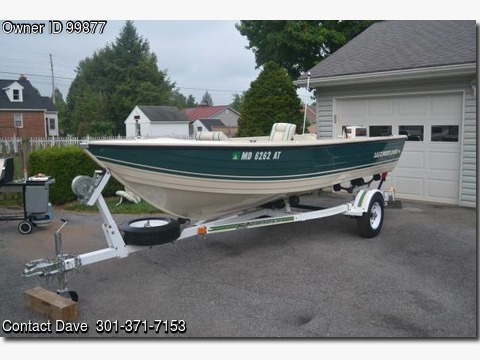 Boat location is Middletown, Maryland. Deep V Fishing & Family Fun Boat. Fully welded – no rivets; floatation equipped; bilge pump tiller w/power trim and tilt; and, new prop. Gas Tanks:2 new Evinrude/Johnson 6 Gallon Dura-Tanks. Seats:	3 Pedestal; Custom made aluminum carpeted bench seat w/cushion at motor.Storage-Two custom made aluminum carpeted side compartments (removable). Trailer:EZ Loader HD trailer with new tires, and repacked bearings. Battery:New deep cycle Die Hard Heavy Duty Battery. Additional Equipment:2012 Deluxe Travel Cover. Draw-Tite Receiver w/2″ball & Master Lock pin. 1994 Minn Kota 65 Electric Motor w/Transom tilt tiller. Hummingbird 40 Fish Finder with portable transom mount transducer. 128 qt. Two 5″ x 19″s De-fender dock protectors. 2 Loc-tite portable rod holders. 4 Life jackets: 2 fishing & 2 tubing. 2 Anchors,Fire extinguisher,Oar,Master Lock Trailer lock,Two spare gas hoses,Exide Battery Charger, Touch up paint,SportStuff Speeder tube and tow rope, Grease gun,Flush mount. Extras- 2 new Champion spark plugs, corded starter key, bilge cleaner, 2 drain plugs, Prop nut and cotter pin, Master Lock trailer tongue lock w/allen wrench, & receiver pin. Serviced in April, 2015.Very Seldom Used – <15x – Garage Kept – Easily convertible for fishing and/or family fun.Much like a 57 Chevy barn find w/5,000 original miles. One owner.